Hey everyone. Got this Cherry board, was going to use this for some cutting boards, are these black spots gum pockets if so what causes this and is it safe to use for cutting boards due to food contact? I was able to scratch into one of them with my fingernail but the other ones seem solid, I think I better use this wood for another project, just wondering what you guys had to say. thanks . Those are Mineral Deposits and yes you can use cherry with Mineral Deposits for a cutting board. Cherry often has what is called “pitch pockets” and it has nothing to do with mineral deposits. I have some cherry in my shop right now where the pitch pockets are much more prominent than what is on your board. This defect is sometimes more desirable than plain cherry because it offers interesting patterns. There may be cherry which has mineral inclusions too but I haven’t seen any. The only problem you will have using that board for a cutting board is that it is flawsawn, so it will warp if one side gets wet and the other is kept dry. Best to rip it into 1 or 2 inch strips and glue it up with a water resistant glue. This is erroneous. It will warp just the same, if one side gets wet and the other doesn’t. Ripping and alternating will prevent cupping that results from changes in moisture content in the WHOLE BOARD. In either case, if only one side gets wet, that side will expand while the other doesnt and the board will cup. Cherry often has what is called “pitch pockets” and it has nothing to do with mineral deposits. 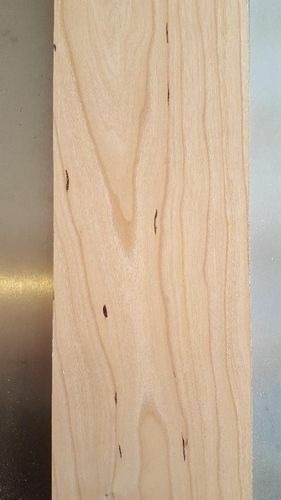 I have some cherry in my shop right now where the pitch pockets are much more prominent than what is on your board. This defect is sometimes more desirable than plain cherry because it offers interesting patterns. There may be cherry which has mineral inclusions too but I haven t seen any. We have a lot of wild black cherry around here, so I use it a lot. What you are calling a “pitch pocket” I am not sure if I have seen or just don’t know what it is. What do they look like? Is it just like the dark spots on the board in this thread? The wood I have right now has no dark spots, but it does have brown spots that appear to be areas where the wood may have started to rot. This was a very large old tree, the biggest cherry I have ever seen, about 5 foot in diameter!! It is in the heartwood, but very soft. I say started to rot because there were some very definite spots in this tree that had turned to rot and these spots, while not as bad, look the same color. The problem with these brown spots is that if I see them I cut around them, but sometimes they “come up” in the wood when finishing or turning on the lathe. There seems to be some conflicting opinions on this. The defects in the wood should not cause a problem but I would treat them with CA (super) glue if you are concerned. The thin CA glue will soak in and harden the wood and if there are any soft or hollow pockets try the meduim CA glue to fill them. The long grain of cherry is not particularly hard so it will not tolerate a lot of knife cutting on it. If you are going to cut it up so you can glue up a cutting board with the end grain for the work surface it will be just fine.. I would choose a harder wood like Maple if working with the long grain. It is possible to reduce the “cupping” mentioned by cutting the wood into about 2” widths and gluing it back up with every other board flipped over so when you look at the end grain it will curve the opposite way on every other board. Putting in properly installed “bread board” ends will help too. The pitch pockets will not be an issue if they all look about like what is in the picture. I agree with Les that cherry cutting boards work best as end grain boards. If it were me, I’d rip that board into 1-1/2 or 2” wide strips, flip them on edge and glue up an edge grain board. After that is dry, cross cut and flip the pieces again to get the edge grain up and glue again. Thanks for the info guys. I will only have a couple strips of cherry in the cutting boards along with strips of Walnut hard maple and purple heart. In the future I would like to make an edge grain or end-grain board . its not rocket science, sometimes a natural defect adds conversation to the piece. I see this kind of thing a lot when I buy “rustic” cherry, which is #2 common, I think. I’ve never had any issues with the pitch causing any issues when I finish the boards. Sometimes you will get a piece that is flat sawn that has pitch outlining where a knot might have been. If there is enough of a void to accept filler then I will fill it. Otherwise, no harm. You might wind up with a nice rift sawn look if you rip the board into strips and stand them on edge. Could get some rays and flecks. The places I am talking about in cherry lumber are not rot. Some may regard them as defects while others, like myself, believe they add character to a project. I select for it at the lumber yard for certain projects. It can be quite prominent in certain trees. I have examined these anomalies in scrap pieces and they don’t appear to have any mineral content. I have seen mineral streaks but they look different. If you don’t know about pitch pockets, just Google “cherry lumber pitch pockets” and you will find dozens of references to it.